Woodland Wednesday at Highbury today involved bird watching and recording in preparation for the BGBW 2016 over the coming weekend. Following 2015's 'Heritage Week' event, 'Between The Oaks II', I feel compelled to at least equal the satisfaction levels for the 2016 National Heritage Week event. Possibly something 'along the lines of hedgerows', a route somewhere in the Rea Valley;....Perhaps 'Beating the Bounds' of Kings Heath. 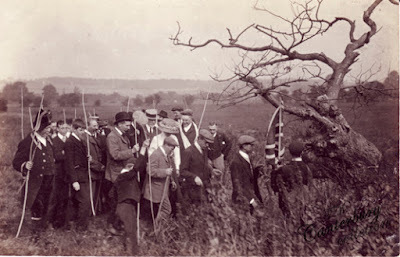 'Hedgerows' are symbolic from a 'conservation' view point, stirring emotions and generating a protective desire when we hear of a stretch under threat from land owners; between the 1950's and 1990's thousands of miles of hedgerow were grubbed out, and many more left unmanaged as farming practices declared them unnecessary. "The concept of ancient woodland was a radical one in the 1970s. The popular wisdom was that woods were human artefacts, and could only begin their lives by being deliberately planted." The Cabaret of Plants, Richard Mabey. This is rather surprising and I'm most intrigued at RM's claim, not that I'm disputing it in any way, but I've imagined Britain in ancient times as a more or less wooded land for most parts, broken only by marshland and mountain top, and even here, I imagined Alder and Willow carr and dwarf or wind blown trees up to the tree line. And whilst this, to some extent, may still be debated, RM's point is that the 'concept of ancient woodland' as a means of distinguishing wooded areas in ecological terms hadn't been addressed until the 1970's. Dead wood, in a variety of conditions and circumstances, is an essential feature of a thriving woodland. 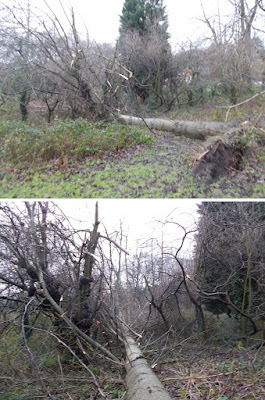 A fallen tree is not always a bad situation, providing there's no injury to people or damage to property, a fallen tree in a wooded setting can be viewed as a positive occurrence as long as the timber can be left in situ. In this instance at Highbury, the tree is safely on the ground and can fall no further. The trunk from hereon will be investigated by a host of creatures including young humans, and will gradually break down through the processes of decay, wear and weathering. Many thanks to Ron for the following photos. Long tailed birds Ringed neck parakeets have become a feature of Highbury Park over the past few years. Nesting in holes, of which there are plenty in standing dead trunks. Highbury Park is well known for its variety of bird life, attracted by its diverse habitats. Over the past ten years or so the park has been addressed with the unmistakable squawks and chattering of parakeets. Hole nesting birds, successfully breeding in standing dead trees and during Winter 2015 a flock of six birds were seen cavorting the park. The park contains a rich mix of trees and tree cover providing opportunities for many species to feed, shelter and nest. Hole nesters Three woodpeckers have been recorded at Highbury, the Great Spotted, most often seen or heard, as well as the 'Yaffle' or Green Woodpecker. Young oak with marble gall - interaction between plant and animal occurs at an early stage The debate here concerns the planting and /or natural development of new woodland. I believe it was Richard Mabey (source to be verified) who said that most planted trees are 'planted in the wrong place', and I take this to mean that a planted tree is unlikely to do as well over a long term as a naturally occurring tree, grown as it stands from seed. Who knows? difficult to say for certain how long a tree can be expected to live. There is a life expectancy for all living things and this depends on many variable factors. This table from the above publication considers the pros and cons of introducing plants to new woodland - decisions have to be made and either way it's not clear cut. "THE BEST TIME TO PLANT A TREE WAS YESTERDAY, THE NEXT BEST TIME IS TODAY"
The weather has certainly been dramatic over the past four weeks or so, leaving many people around Britain in despair. The persistent flooding has led to 24 hour media attention, heated debate involving almost everyone, inevitable finger pointing and blaming but very little in the way of hope for those living in flood prone zones. For what hope is there when we are told to expect further deluge and for those living in high risk areas struggling to get insurance for their property. Other evergreens alongside our collections and plantations of conifers include some interesting broadleaved species such as Ivy, Holly and Holm Oak. Ivy in particular causes strong debate amongst tree managers as their considerations involve public health and safety alongside the welfare of individual trees. Richard Mabey tells us that "Attitudes towards ivy have been ambivalent since classical times" (Flora Britannica). Once believed to counteract the effects of alcohol, observed in the plant's ability to "smother grapevines" and thought to indicate some sort of cure for, or prevention of hangover. OK the Christmas theme is almost over but there remains a pang of interest in 'evergreens' and conifers at this time of year - and it is only the 10th day of Christmas - and perhaps the only time throughout the year that attention is given, by some, to identification. Over the past couple of years, during broadleaf dormancy, I have developed an interest in 'gymnosperms' (naked seeds), evergreens or conifers, what we call them somewhat depends on our preferences and how pedantic one might be, perhaps 'evergreen conifers including Larch' is most accurate in this case; and they can provide a welcome distraction from the commercial clubbing we get between October and 25th December. 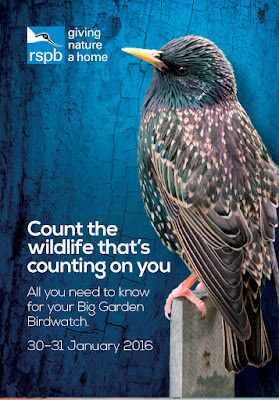 The BGBW doesn't have to be in your garden, after all not everyone has a garden, so why not use the local park or woodland? Our garden birds are also woodland birds adapting to urban conditions and dependent on food from the bird table or feeding station. 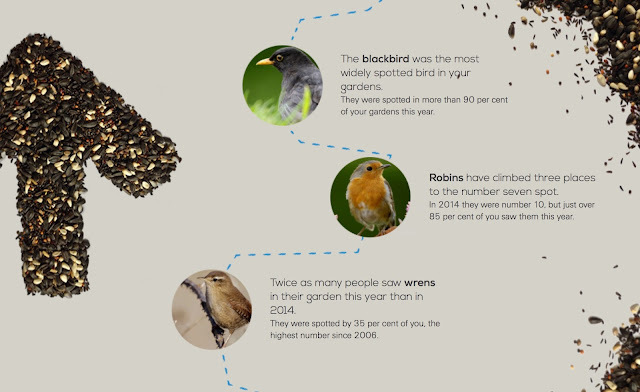 Further details can be found by visiting the RSPB website. I aim to spend one hour at Holders Woods on Saturday and one hour at Centenary Woods on Sunday.